al'-a-bas-ter (alabastron (Mt 26:7; Mr 14:3; Lu 7:37)): In modern mineralogy alabaster is crystalline gypsum or sulphate of lime. The Greek word alabastron or alabastos meant a stone casket or vase, and alabastites was used for the stone of which the casket was made. This stone was usually crystalline stalagmitic rock or carbonate of lime, now often called oriental alabaster, to distinguish it from gypsum. The word occurs in the Bible only in the three passages of the Synoptic Gospels cited above. ⇒See a list of verses on ALABASTER in the Bible. ⇒See also the McClintock and Strong Biblical Cyclopedia. Your Bible study is too important to leave to a web search. Discover the power and simplicity of SwordSearcher: A complete scripture study package, with millions of cross-references, and thousands of topical and encyclopedic entries all linked to scripture, fully searchable and indexed by both topic and verse references. Edited by James Orr, published in 1939 by Wm. B. Eerdmans Publishing Co.
Website HTML, editorial descriptions, and images ©2019 StudyLamp Software LLC. Source: ISBE book module from SwordSearcher. 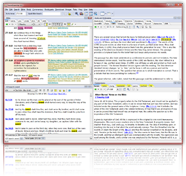 Scripture reference tagging and popups powered by VerseClick™.